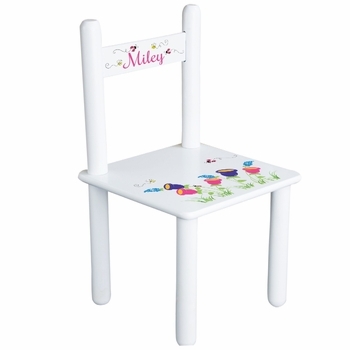 This personalized chair is just the right size for all the little people and includes personalization. It�s lightweight and the seat is just 12 inches high - perfect for playtime, reading, and other activities. Chair comes customized with the child's name professionally imprinted on the back along with your choice of one of over 70 cute designs. The chair pictured shows our English Garden design. This custom chair also has the option of being a perfect "Time Out" chair. If you select this option, we will imprint those famous words in addition to the design you choose. Click on More Images to see the "Time Out" version of this chair. Please note, minor assembly is required and it goes together easily without any tools. The chair seat measures 12 by 12 inches and the backrest is 23 inches high. All ink used is certified non toxic.